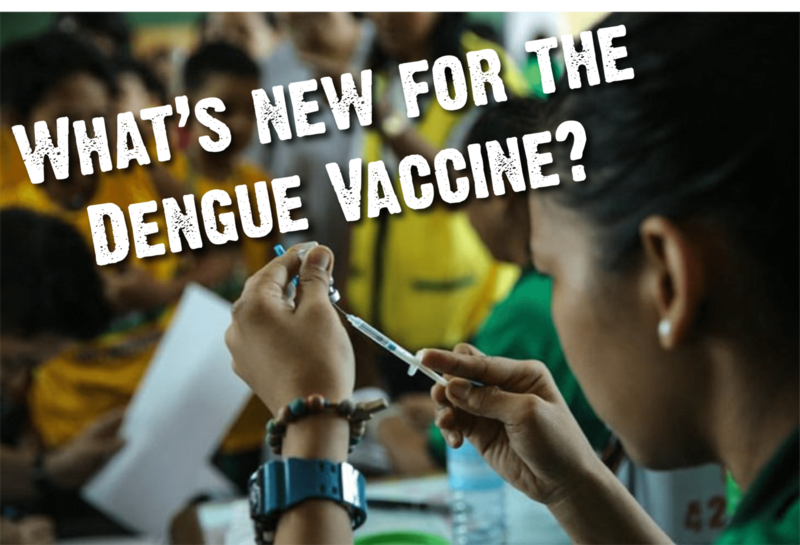 What’s new for the Dengue vaccine? A process, led by WHO, to bring together independent experts to review data on the Dengue Vaccine, Dengvaxia® (CYD-TDV), has led to new recommendations from the advisory board on immunisations. This post supplements and summarises the “Question and Answer” article on the Dengue Vaccine from December 20171. Briefly, the key findings from the two large Phase 3 trials demonstrated that vaccine efficacy was 65.6% among 9-16 year olds with virologically-confirmed Dengue over a 25-month period. The vaccine reduced severe Dengue cases by 93% and hospitalisations by 82%. But in the 2-5 year age group, there was an increased risk of hospitalised Dengue in year 3 of follow-up. Because of the higher efficacy of the vaccine and the absence of an increased risk of hospitalised dengue cases in older children (9 years+), licensing was sought in 2015. However, mathematical modelling experts stressed that vaccination programmes would only be effective if seropositive individuals in a particular age group were targeted exclusively. New analyses indicated that overall benefit to the vaccinated population remains “favourable” but, importantly, the vaccine performs differently depending on the sero-status of an individual. For example, there is an increased risk of hospitalised and severe dengue in seronegative individuals starting about 30 months following the first dose. In light of the new evidence on the long-term safety issue in seronegative individuals, weighed up against the reported efficacy and safety in seropositive individuals, SAGE presented two strategies: population seroprevalence criteria versus pre-vaccination screening. SAGE acknowledged that currently both “population seroprevalence criteria” and “pre-vaccination screening” are programmatically difficult approaches for achieving high population protection from dengue. A pre-vaccination screening strategy, making use of dengue IgG ELISA assays, is a preferred option when commencing vaccination as part of a control programme. Only sero-positive patients should be vaccinated following this. No assay is 100% specific and therefore some truly seronegative individuals may be vaccinated due to a false positive test result. Furthermore, the vaccine does not yet provide complete efficacy. Hence, the limitations of CYD-TDV will need to be clearly communicated to populations offered vaccination. Currently the vaccine is recommended for ages between 9 and 45 years of age. The age to target depends on the transmission intensity – hence it would be lower in areas of high transmission intensity. CYD-DTV is currently recommended as a three-dose series given 6 months apart but this is in absence of sufficient data on vaccine safety and efficacy using fewer than three doses. The SAGE highlighted the need for research into potential booster requirements and assessing the ease of immunisation schedules going forward. An improvement of serological assays for Dengue was also suggested in order to improve specificity and sensitivity in detecting seropositive individuals. In particular, within areas where other, related flaviviruses are present. Current Rapid Diagnostic Tests (RDTs) could be acceptable in high transmission regions for now, given that high specificity is not necessary1. The current vaccine still requires higher efficacy to see a sustained impact on seroconversion in other locations globally but evidence from the trials is highly promising and suggests a use for this in the fight against this deadly arbovirus. WHO`s Global Advisory Committee on Vaccine Safety (GACVS) and the WHO Secretariat published interim statements on December 7, 2017, and December 22, 20171, respectively. Further details of the interim report can be found here and specifics regarding the vaccine can be found here. World Health Organisation (2017) Updated Questions and Answers related to the dengue vaccine Dengvaxia® and its use. Available at http://www.who.int/immunization/diseases/dengue/q_and_a_dengue_vaccine_ dengvaxia_use/en/.